One of the most notorious and successful bands of the hair metal era, Los Angeles rockers Mötley Crüe burned through the '80s in a blaze of drugs, debauchery, and platinum hits. Their glammed-out image, hard-partying reputation, and a knack for melding pop hooks to heavy metal theatrics took the band to the top of the charts repeatedly throughout the '80s, records like 1985's Theatre of Pain and 1989's Dr. Feelgood bringing them to sold-out arenas around the world. Their wild lifestyles took a toll, however, and by the early '90s the band imploded, with lineup changes, legal turmoil, and a generally shaky times. They still remained one of the more beloved bands of their pop metal heyday, and the 2000s brought reunions of the original lineup, new albums, and even a biopic focusing on their infamous early years. Formed in January 1981, Mötley Crüe were originally the pet project of bassist Nikki Sixx (born Frank Ferrana), vocalist/guitarist Greg Leon, and drummer Tommy Lee (born Thomas Lee Bass). Leon was a veteran of the Hollywood scene, having replaced Randy Rhoads in Quiet Riot two years prior. He butted heads with the strong-willed Sixx, however, resulting in his departure from the lineup several months later. Local guitarist Bob "Mick Mars" Deal joined in his place, bringing the moniker "Mottley Krue" with him. After altering the name and adding a pair of umlauts (allegedly a tribute to German beer), the trio began efforts to recruit Vincent Neil Wharton, vocalist for the L.A.-based band Rock Candy. Neil initially refused the advances, only joining the band after his Rock Candy cohorts announced their decision to transform their group into a new wave act. With Neil now on board, Mötley Crüe became a cult favorite on the L.A. circuit, infamously known for such theatrics as setting Sixx's pants on fire mid-song. The band soon secured management with Allan Coffman, who financed recording sessions for a debut album. Initially released in November 1981 by Lethur Records -- a small, independent label launched by Coffman and the band -- Too Fast for Love sold a surprising 20,000 copies. It also prompted a Canadian tour, where the musicians made headlines by wearing their spike-laden stage attire onto the plane, carrying suitcases of pornographic material through airport security, and fielding death threats from incensed fans in Edmonton. Such exposure only served to fuel Mötley Crüe's sensationalist appeal, generating the sort of shocked press coverage that the band desired. 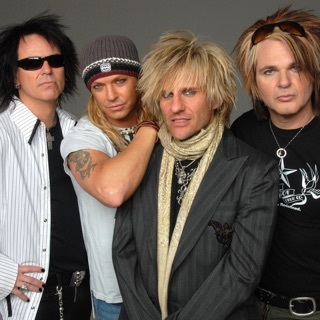 Back at home, Elektra Records was impressed by the band's popularity in local venues, prompting the label to sign Mötley Crüe before releasing a new, remastered version of Too Fast for Love. Following the band's return to California, Elektra also released their sophomore effort, Shout at the Devil, in 1983. The video for "Looks That Kill" became an MTV hit, broadcasting the group's glammed-up theatrics to an audience unfamiliar with Mötley Crüe's popularity on the club circuit, and the record went platinum as a result. Shout at the Devil sold an additional million copies in 1984, but the party was brought to a temporary standstill when Vince Neil crashed his car on December 8, killing passenger Nicholas "Razzle" Dingley of Hanoi Rocks. The other victims emerged with broken bones and brain damage, while a relatively unscathed Neil was found guilty of vehicular manslaughter and driving under the influence. He was ultimately incarcerated for 15 days in 1986, in addition to performing community service and paying a large cash settlement. By the time Neil was sentenced, however, the band's newest record, Theatre of Pain, had already enjoyed a lengthy stay on the charts, cementing the band's mainstream status and producing Mötley Crüe's first Top 40 hit with a cover of Brownsville Station's "Smokin' in the Boys' Room." Neil's stint in jail was brief, and the band was free to continue its decadent reign. Under the management of Doug Thaler and Doc McGhee, the latter of whom also managed Bon Jovi, Mötley Crüe's popularity expanded throughout the latter half of the '80s. "Home Sweet Home," a power ballad from Theatre of Pain, yielded another popular music video, while a 44-minute home video cassette entitled Uncensored was issued in 1986 to multi-platinum sales. Meanwhile, Lee married actress Heather Locklear, and the band returned to the studio to record a fourth album, Girls, Girls, Girls. Released during the band's substance-addled heyday in 1987, the album debuted at number two, with the raunchy title track becoming Mötley Crüe's second Top 40 hit. The group quickly embarked on a headlining tour, but the European dates were canceled when Sixx suffered a near-fatal heroin overdose. He was pronounced legally dead en route to the hospital, only to be revived by two shots of adrenaline to the heart. Upon returning home, Sixx immediately shot up once again. Shocked, Thaler and McGhee urged their clients to enter a drug rehabilitation program, and Mötley Crüe remained out of the spotlight while the bandmates cleaned up their act. They returned in 1989 -- clean and sober this time -- with the release of Dr. Feelgood, a muscled album that became Mötley Crüe's first release to top the Billboard charts. 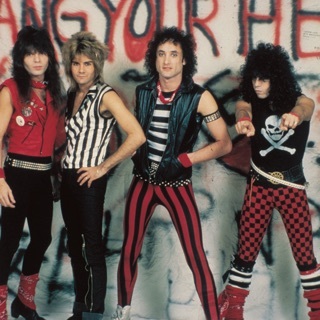 Meanwhile, the title track became the band's first Top Ten hit, and a string of additional singles -- "Kickstart My Heart" (inspired by Sixx's brush with death), "Don't Go Away Mad (Just Go Away)," and "Without You" -- made Dr. Feelgood the most successful Crüe album to date. After another worldwide tour, the compilation album Decade of Decadence arrived in 1991, propelled to multi-platinum status by a new version of "Home Sweet Home" that became the band's final Top 40 hit. After creating their own record label, Mötley Records, the bandmates signed a renewed contract with Elektra for $25 million. The music industry had begun to devote most of its attention to grunge music, however, and the pressure to keep pace with changing trends took its toll on the band's camaraderie. In 1992, sessions for Mötley Crüe's next album turned ugly, leading to the dismissal (or departure, depending on the source) of Neil, who was replaced by the Scream's John Corabi. The revised band issued Mötley Crüe in 1994, which peaked at number seven in the U.S. and eventually went gold. Such an attempt to embrace a new, grungier sound proved to be a commercial disappointment, however, as did the band's supporting tour. Corabi was fired in 1997 at the label's behest, and Neil returned to the lineup for the release of Generation Swine. The subject of a heavy marketing campaign, Generation Swine debuted at number four, although it failed to generate any significant singles. Meanwhile, Corabi resurfaced alongside former Kiss guitarist Bruce Kulick in the group Union. Shortly after the release of Greatest Hits in 1998, Tommy Lee was arrested for spousal abuse against Pamela Anderson. He spent most of the year in jail, effectively killing any momentum generated by the gold-selling status of Greatest Hits and Generation Swine. Meanwhile, the group's contract with Elektra fell apart, prompting Mötley Records to switch its affiliation to the Beyond label. The band acquired the rights to its back catalog in the process. After numerous bitter encounters with Neil, Tommy Lee left the band in 1999 to form Methods of Mayhem, which released a self-titled debut album later that year. He was replaced by former Ozzy Osbourne drummer Randy Castillo, and the revamped lineup celebrated its acquisition of the Crüe catalog by issuing remastered editions of every studio album, as well as the rarities collection Supersonic & the Demonic Relics. A collection of new material, New Tattoo, appeared in the summer of 2000 to a lukewarm reception, and Castillo was stricken with an undisclosed illness on the eve of the requisite tour. While he recuperated at home, the band temporarily enlisted Hole's drummer (and lifelong Crüe fan), Samantha Maloney, to handle percussion duties. In May 2001, the band issued a best-selling, tell-all biography entitled The Dirt. During the downtime that followed its release, Neil launched a brief solo tour of U.S. clubs and Sixx wrote material for other artists, including Tantric, Meat Loaf, Faith Hill, Tim McGraw, and James Michael. Sadly, Castillo succumbed to cancer the following spring, prompting the band to continue its hiatus. Although Sixx speculated publicly about the possibility of a reunion tour, Tommy Lee quickly rebutted such rumors, claiming that his relationship with Vince Neil was simply too poor for any sort of reconciliation. Controversy surrounded the band again as former producer Tom Werman sued for unpaid royalties, Neil's former wife Heidi Mark publicly accused him of physical abuse, and Neil was kicked off a nationally syndicated radio show for being too drunk to maintain an interview.